We came home today from our trip to Florida (more on that later) to find that our Elf on the Shelf Max has returned! He joined our family last Christmas and if last year was any indication, there will be lots of elf shenanigans going on this house again! Day 1 was Max excavating the leftover Halloween candy. I know, I know, how do we have any leftover Halloween candy? Well, we put it up so the boys couldn’t get into it and out of sight, out of mind, I suppose. Brogan was the first to see Max when he walked in and he was SO excited. He was excited for a couple of reasons… 1) that Max actually returned (because elves only visit good boys and girls), 2) that he was on his excavator (one of Brogan’s favorite toys) and 3) that he found all the Halloween candy. Needless to say, we’ve got one very excited little boy who is thrilled that it is Christmas time again. 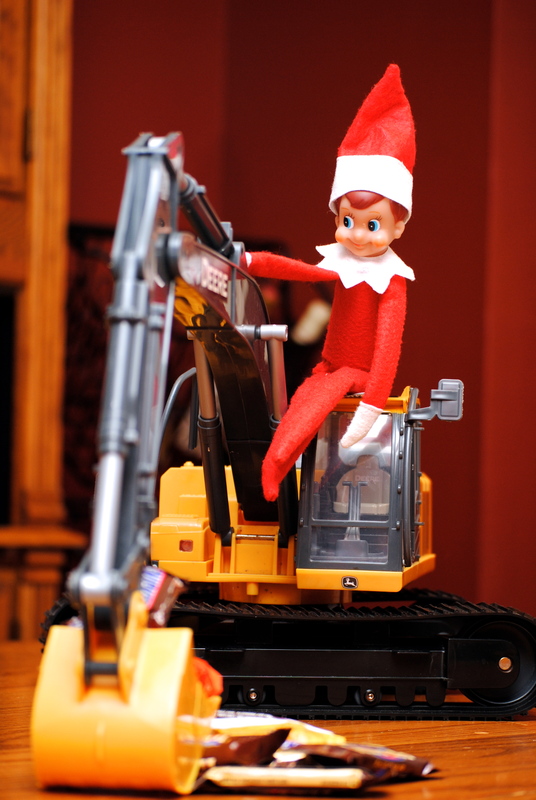 This entry was posted in Holidays and tagged Christmas, Elf, Elf on the Shelf, Excavating candy, Holidays, Kids, Max, Traditions by biscuitsncrazy. Bookmark the permalink.